Spirit Spot is a microgame found in WarioWare: D.I.Y. Showcase, featured in Dribble & Spitz's stage and returns as one of Orbulon's microgames in WarioWare Gold. There are some people walking in front of glass windows. These reflect all people, except one. The person with no reflection must be tapped by the player, and they will turn into their true form: a ghost. 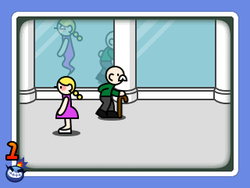 The WarioWare Gold version has the ghost person's reflection look more like a ghost than a regular human. Level 1 difficulty: Two people walk across the screen. 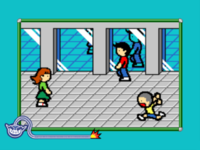 Level 2 difficulty: Two people walk across and one person stands still. Level 3 difficulty: Three people walk across and one person stands still. This page was last edited on October 14, 2018, at 19:16.